The containers could be a wee bit larger and the opening as I have large hands, but other than that, Golden Milk Turmeric Infusion with Grass Fed Whey & Warming Sprices by Jarrow Formulas was great. 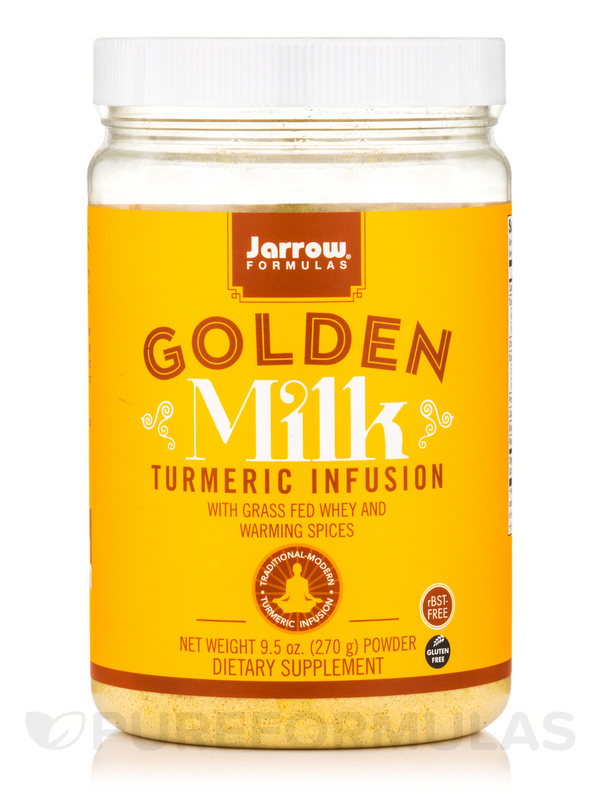 Jarrow Formulas® Golden Milk is a contemporary adaptation of the classic Indian home recipe of turmeric‚ milk‚ tea and spices enjoyed for centuries. Jarrow Formulas® Golden Milk is a mixable powder of delicious grass fed whey protein concentrate plus milk protein concentrate and coconut milk‚ seasoned with organic turmeric‚ cinnamon‚ organic ginger root and a hint of black pepper. Golden Milk invigorates the senses even as its spices warm the digestive system. Ingredients: Grass-fed whey protein concentrate‚ milk protein concentrate‚ coconut milk‚ organic turmeric‚ natural French Vanilla flavor‚ cinnamon powder‚ black pepper‚ organic ginger root‚ sunflower lecithin and Lo Han Guo (Momordica grosvensorii). No wheat‚ gluten‚ soybeans‚ egg‚ fish/shellfish‚ peanuts. Mix 1 heaping scoop (13.5 Grams) with 4 to 6 oz. hot water‚ warm milk‚ or warm almond milk and drink. Allergen Caution: Contains: Tree Nuts (Coconut) and Milk. OK, I've never tried any other Golden Milk mixtures of any kind, so I went in with zero expectations, but was pleasantly surprised. Yes, it does take a bit of effort to mix all of the powder in, but oh well. That's a first-world problem, folks. I found the Golden Milk Turmeric Infusion with Grass Fed Whey & Warming Sprices by Jarrow Formulas to be tasty, warming, and soothing. I added some coconut milk to it for an even smoother taste, and on a cold, rainy NW Oregon day it's just the thing I needed after a busy day to warm up, relax, and unwind. I recommend it. The opening on the container needs to be larger to accomodate large hands. I've been making my own Golden Milk and wanted a mix to make it faster. Tried it first with coconut milk and I thought it was awful. Tried again with water and I add a lot of honey and it is passable. The one I make is sweet, this Golden Milk Turmeric Infusion with Grass Fed Whey & Warming Spices by Jarrow Formulas one is more savory. It is just not my thing. It is better than the Gaia brand Golden Milk I bought. It has protein powder in it as well, which I thought might help me stay asleep, but this formulation does not help me relax and sleep better like my homemade version. I will use it up, but most likely not order again. I just don't like the flavor and I have to add too much honey to it to like the taste. The taste and it does not help me sleep better as I expected. I got a refund, this stuff was awful, it did not dissolve, it clumped and was tasteless. I have had the Gaia brand and it was delightful, but this Golden Milk Turmeric Infusion with Grass Fed Whey & Warming Spices by Jarrow Formulas was not, it was horrible and PureFormulas gave me a refund and I am waiting till the Gaia is back in stock to get more, the Jarrow is not drinkable! Nothing, but I did get a refund, so all is well. Good customer service. It did not dissolve in almond milk, stayed in big tasteless clumps. I add a scoop of Golden Milk Turmeric Infusion with Grass Fed Whey & Warming Spices by Jarrow Formulas to my breakfast shake every morning. It has a subtle yet delicious flavor. It mixes quickly and easily and has a smooth consistency. I would definitely order this product again.